Made 2 Measure Signworks and we are very happy with the results. Take your business to a new level with attractive, high-visibility vehicle wraps and graphics! 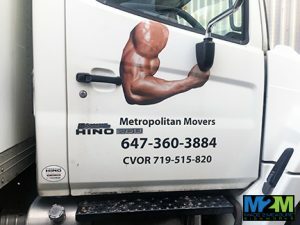 Made 2 Measure Signworks creates truck wraps, trailer wraps, van wraps, car wraps, and more for any business looking to improve brand recognition. 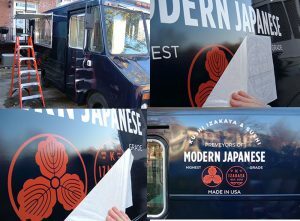 Whether you have a food truck or an entire fleet of commercial vehicles, we can create the perfect vinyl wraps for your business vehicles. In addition to our custom design and local manufacturing, Made 2 Measure Signworks staffs an expert team of vehicle wrap installers, trained to ensure your project is perfectly executed. Whether you need wraps for your trailers, trucks, boats, commercial vans or personal vehicles, Made 2 Measure Signworks is your local professional signage company dedicated to helping your business grow! 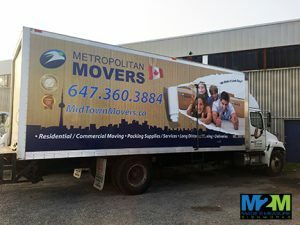 Call Made 2 Measure Signworks at (647) 699-7654 for a Free Consultation with a Commercial Vehicle Wrap Expert! Not every business needs a full vehicle wrap, but that doesn’t mean your car can’t still be the promotional tool you need! Partial wraps, vinyl graphics, and magnets are all viable options for all of your vehicle promotional needs. 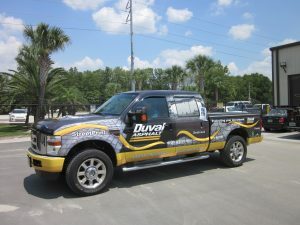 Few options provide the same high-impact advertising power as a full vehicle wrap. Made 2 Measure Signworks creates seamless coverage for your truck, bus, trailer, van, or car. These full-colour vinyl wraps send a striking, powerful advertising message to any who see them. Our vehicle wraps are completely customizable, providing you with an end product that fits your brand, business, and message. We create all of our wraps on heavy-duty, premium-quality vinyl designed to provide striking, beautiful images that also protect the original finish of your wrapped vehicle. When full-wraps aren’t an ideal solution, partial wraps offer you the option to zone onto specific areas of your car for promotional purposes. With a partial wrap, you can add custom messaging and graphics to any part of your vehicle, including you hood, bumper, tailgate, side panel, door, or any combination of the above! We will apply your partial car wrap to any surface of your vehicle, working with the joints and natural lines of your care for a beautiful, seamless finish. 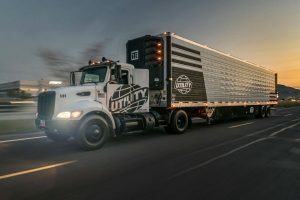 When you need your investment to go further on a tight budget, this can be the perfect solution that gives you the feel of a full wrap without the cost. Vinyl graphics are a fantastic option when you need minimal text or a more simplistic look for your promotional needs. Vinyl graphics are cut individually from sheets of vinyl, allowing you to place your graphics anywhere for a minimalistic look and feel. It is an ideal option for when you require the flexibility to add and remove or update your graphics as your needs change, all within a budget everyone can agree with. 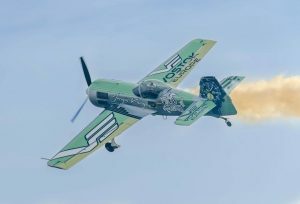 Cut graphics are best the best option when you need a single image, logo, or when requiring minimal text. Sometimes you don’t want to take your work everywhere you travel. Vehicle magnets are a perfect solution for advertising your business, when and where you want. These present the easiest option to replace and remove as you wish, especially when needing to change vehicles or when signage is restricted where you live. Vehicle magnets are available in various sizes, shapes, and styles, and provide the least labor intensive option available. If you’re looking for a way to complement your full-wraps or partial wraps, perforated window film is the solution for you! Your corporate or brand message can be printed directly onto this film without compromising the visibility of your vehicle inhabitants. These wraps also provide privacy to the interior of your vehicle while adding a flare to your promotional wraps or graphics! 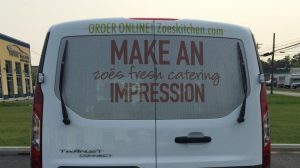 Whatever your ideas or thoughts are for your graphics or vehicle wraps, Made 2 Measure Signworks is here to provide you superior vinyl options! Whether you want a cohesive look for your van wraps, trailer wraps, fleet wraps, personal car wraps, or simply want a makeover for your vehicle, Made 2 Measure Signworks has the experience, tools, and resources to craft the perfect wrap and graphics for all of your needs. For every vehicle type and business need, we have attractive, high-impact graphic options. Whether you are working with a smaller budget, or looking to tackle a large project, we can help you maximize your impact with smart placement and creative design of your marketing elements. Made 2 Measure Signworks not only provides high-quality vehicle wraps, we also provide impactful, eye-catching business signage including indoor signs, outdoor signs, vinyl signs, and any custom signs you desire or require. Vinyl wraps and graphics are an ideal way to publicize your business and increase your customer perception. Operating a business that often visits clients homes, such as electricians, exterminators, cable installation teams, or locksmiths, can be very difficult when your client is hesitant to allow you into their home. Having your vehicle displaying your business name goes a long way towards gaining your customers trust that you are who you say you are. While ad wraps have become increasingly popular across various industries, some businesses rely heavily on them such as plumbers, handymen, repair techs, cable companies, electricians, delivery vehicles, dry cleaners, landscapers, tutors and many more. 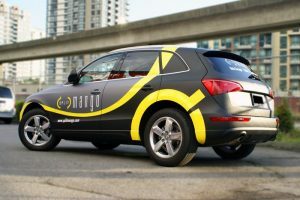 It is our belief, however, that everyone can benefit from vehicle graphics and wraps! As you drive around during your day-to-day activities, your wraps will publicize your business and attract potential customers along the way. Our wraps stay beautiful regardless of the weather. By spreading pertinent information about your business and protecting your cars original finish, promotional car wraps are an ideal long-term investment! Companies that don’t have a retail location or work out of shared office space or home often have trouble marketing to their local customers. Vehicle wraps are a perfect branding solution that gets your business brand and message out there, allowing you to build your business! When you want to completely transform your car, we can include your windows for a sleek, seamless look! These are entirely legal, allow some interior privacy all without interrupting your vision. Do you own a marina or operate a water-related business? Made 2 Measure Signworks also provides marine-grade vinyl solutions for your boats and trailers! These are ideal for corporate, personal, or charter usage. Our vinyl wraps are durable enough to withstand fresh water, salt water, and even sand. If you offer boat rental services, this is a fantastic way to protect your investment while putting your message out there consistently. If you operate near the water but don’t have a boat, we can still wrap your trailers, trucks, food trucks, or any other vehicles in the same high-quality wrapping for maximum longevity. Made 2 Measure Signworks assists with design of your auto vinyl graphics and wraps. Custom wraps allow you to brand your vehicle any way you want, from a photo to a logo and text and various other elements. During our free consultation, our talented staff of designers will assist you with the various options, styles, and sizes to ensure that your signage project fits your brand, business personality, and budget. Our dedicated, expert staff will be with you throughout your entire vehicle wrapping project. We start with a free consultation where we discuss with you what type of vehicles you own, how you want your wraps to promote your business, and what level of coverage would best fit your business needs. Once we have a good understanding of your ideas and goals, we will create a “mock-up” of your signage project for you to alter as you desire, including size, shape, text edits, and graphic placement. This shows exactly what you’re getting so you’re as happy with your project as we are to make it. Once you’ve approved of your project design, our fabrication team will begin creating the individual elements for your graphic or wrap right here in our Toronto signage shop! Once we’ve completed your wrap, our expert installers will professionally apply your wrap to your vehicle, ensuring it is free of bubbles, tears, warps, or ripples and is aligned perfectly. Should you want to change, update, or remove your wrap, we are here to help you with that as well, we even can make minor and major repairs. Whether you need individual graphics, magnets, full or partial wraps, Made 2 Measure Signworks will ensure you get the right signage solution that best fits your intended use and business goals. 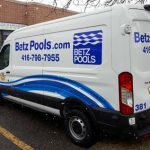 We focus on creating attractive, high-visibility vehicle wraps and graphics that get your brand and business noticed. 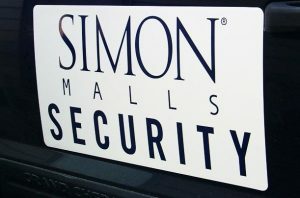 When you need a reliable signage partner that you can depend on, look no further than Made 2 Measure Signworks. Call Made 2 Measure Signworks at (647) 699-7654 for your Free Consultation with a Vehicle Wrap Specialist! We couldn't be happier with their work! The team was great to work with.